Being Eclipsed: eXQuery M0 is out! Cheers for EclipseCon 2009! eXQuery M0 is out! Cheers for EclipseCon 2009! After 5-day rush, I release the eXQuery M0 today. Cheers for EclipseCon 2009! The snapshot demonstrates two features, simple token coloring, and multiple errors reporting. The man behind the nice face of IDE is the nice parser. 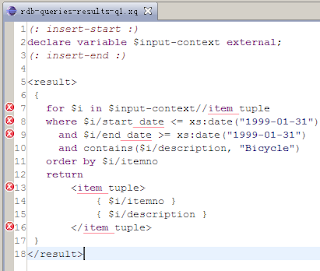 The eXQuery project is a pre-exploring project for my last gsoc effect. The basic goal has been achieved. Now I'm a veteran with XQuery:) Cong! I feels 70% pleased with the semi-ugly XQuery parser. But I feels 95% pleased with the working combination of LPG and IMP. Isn't it cool if you can get one simple IDE for a working language(not toy language!) in one week? !